For the record, Mike doesn’t count as an associate. 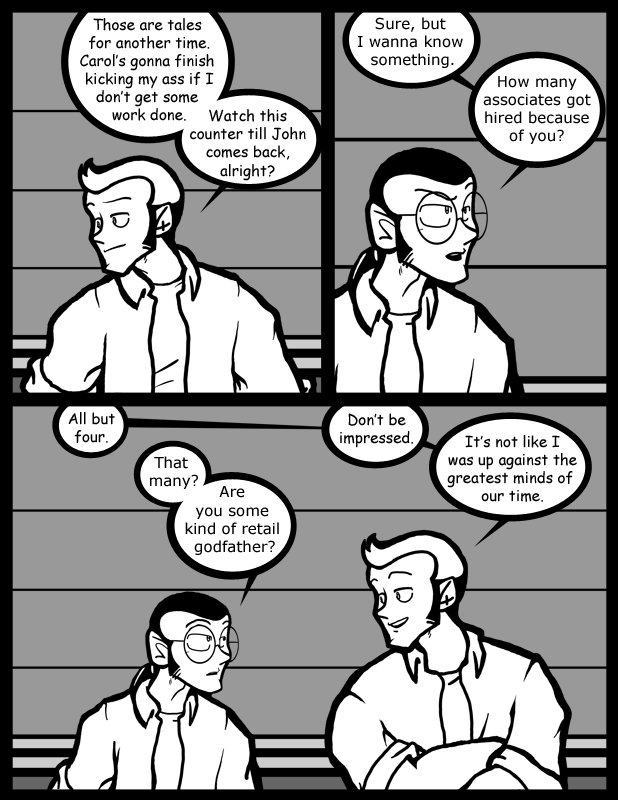 This happens after comic #87, Broken Strings, in which Mike tells Thomas he’s hired Wesley Asel. Mike and Wesley, that makes two. John, in about 4 comics, reveals that he is “not one of the chosen,” making three. Now the question is did Thomas hire Reggie, and if so, then why? Reggie could be number 4, or there could be something very twisted going on…. And there’s also Ed now. Is Mike an “associate?” I don’t think so, but assuming he counts then we know all four now. You guys are missing something. He said he had something to do with all BUT four of the hires. Another interesting point to look at, Thomas obviously can’t hire himself. You don’t count as your own associate. I doubt he would count himself. Its kinda obvious you cant hire yourself. We might be missing something else. Not everyone he didn’t hire has to still be working there. Oh, and managers don’t appear to count, since John was hired ‘a few managers ago.’ Managers tend to get [pro/de]moted from within anyway.